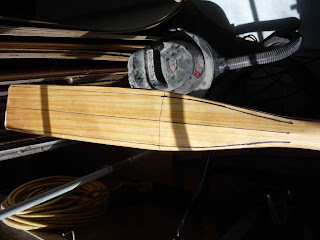 Shaping up a set of store bought oars. Lets get the jokes out of the way, the one about this being a “two oars-power cruiser” and the one about “keeping things on board oar-derly “. 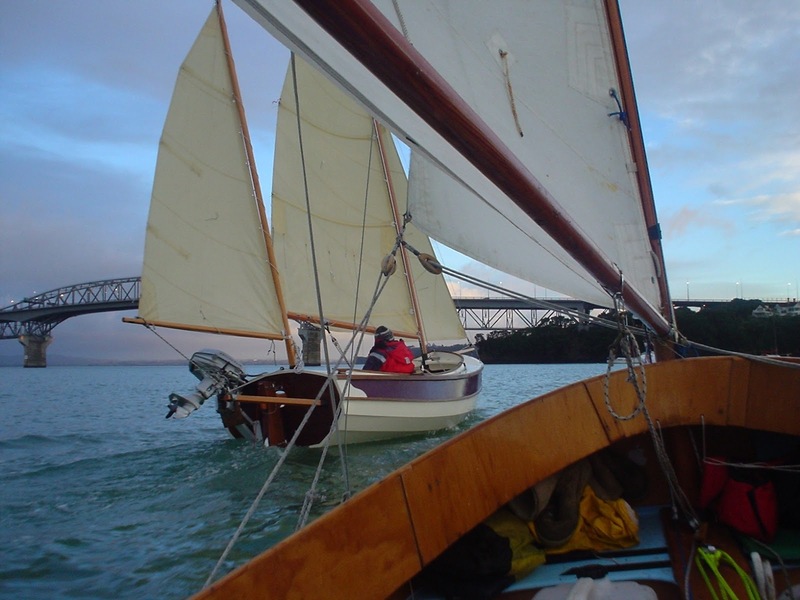 Oh, and the one about the Greek Bireme that docked too close in at speed, “Dis-Oared-‘er”. With that out of the way, I want to show how I go about turning a pair of off the shelf machine made oars into something that I like to use. As they come they’re robust, but very heavy and unbalanced, tip heavy so a lot of downward pressure on the handles to lift the blades on the recovery. So to make them easier to use, more pleasant and just “nice” I cut the oversize blades down a little, shave the blades thinner with a ridge down the middle to keel them sufficiently stiff, and slim the shaft from the “leather” down to the “neck. 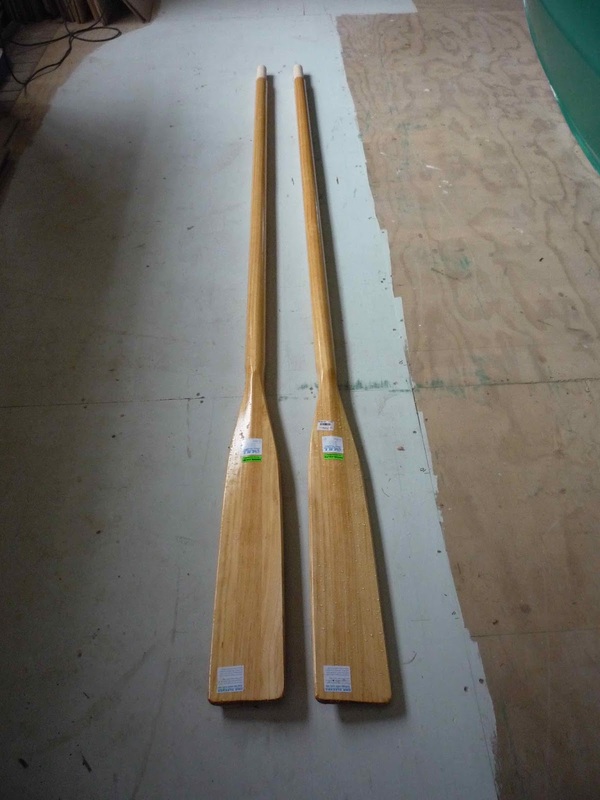 Oars should ideally be matched to the boat, this one being a sailing boat will have a little more resistance than a lighter and more slender boat, so needs oars that are slightly more stiff than the ones for the pure rowing boat. They need to be practical too, which means a thicker blade and a more robust tip so I can use them to pole the boat in the shallows or push off a jetty somewhere. 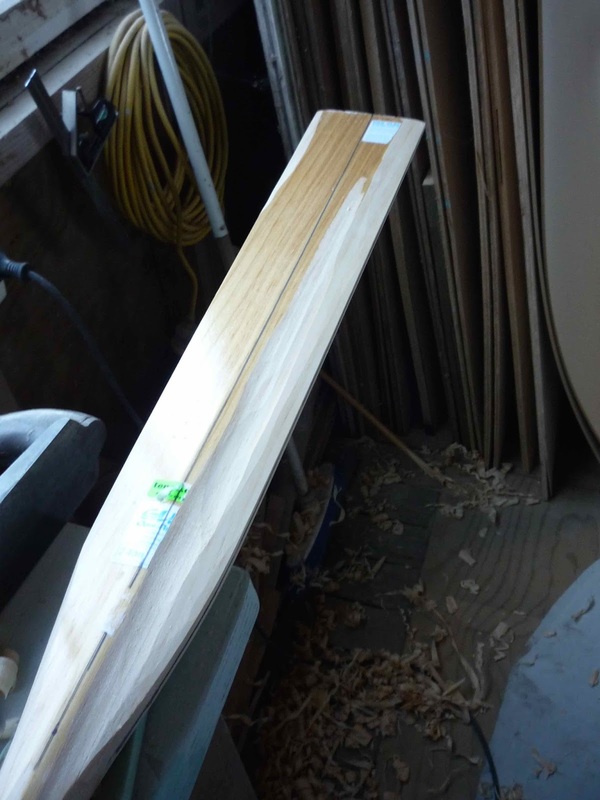 The species of wood used needs to be taken into account, European Ash (Fraxinus Excelsior) used to be commonly used and is tough, resists damage and makes a reasonably good utility oar . But its heavier than I like, and the costs more than I like to shell out for a pair of oars that I’m not going to use as the boats primary propulsion. This is a sailing boat after all. Spruce, (Picea Sitchencis) by comparison is much lighter and is strong for its weight but crushes very easily so an oar made from this may be easily damaged. All that’s a bit academic though, as the ones that are available off the shelf here are stated to be “Tasman Pine”. Good old Pinus Radiata, actually not bad stuff for this use if chosen carefully. Its mid range in weight for a softwood, fairly strong for its weight and if kept well coated with varnish reasonably stable. So that’s what I’m working with today. For a boat of this anticipated resistance to movement I prefer a slightly narrow blade, 90mm wide at the tip, 80mm wide at the neck end, 6mm thick at the edges of the blade, with a prominent ridge down the middle to stiffen it, the neck will be around 30mm through the vertical axis ( that’s in line with the blade) and full width which in this case is about 40mm at 90 deg to the blade, a fat oval section there to orientate the thickest part of the section to the load. Tools. Making that hollow section from the ridge down the middle of the blade out to the edges is what stops a lot of people. I’m fortunate to have come across a round mouthed spokeshave and as a tool “enthusiast” ( not what my wife calls me) I bought it just in case I found a use for it. Its not rounded front to back, this one is radiused from side to side so makes a hollow. Ideal. But there are other ways. I”ve used the nose end of a belt sander, offered up at an angle and run along it will carve a hollow, a small angle grinder with 40 grit sandpaper on a flexible backing piece will do an excellent job with practice, a random orbital sander would do the job and in fact that’s what I use to do the finishing, and if you are either very determined or very lucky, you can use a hand plane with a rounded blade and bottom. By lucky and determined, I mean that while those are rare its not that big a deal to make one. To make mine I used a worn out horse hoof rasp for the blade, lots of grinding required but its good steel, a block of beech for the body, an offcut of Australian Jarra for the wedge and a piece of copper rod to retain the wedge. There is lots of information on making planes out there on the net, but most of them overcomplicate things, but if that’s the way you want to do it, you’ll find it. 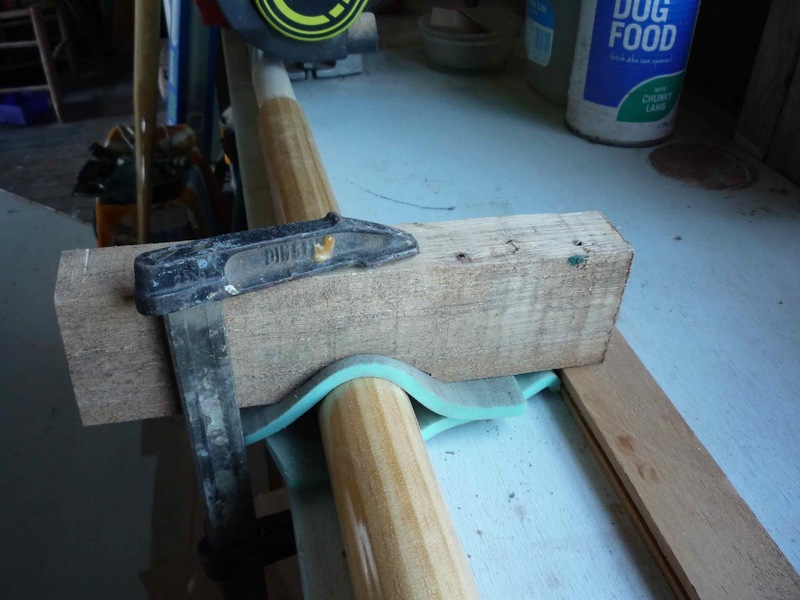 So having bought my “store bought” oars, which incidentally cost not a great deal more than enough of the more “suitable” material in plank form, I first made a couple of simple “holders” to clamp the shaft in order to work on them. Next was to mark out the blade and the neck with a ruler and a sharpie marker, that shape being cut out with a jigsaw and the edges planed smooth and straight. The next step was to mark the center of the edges with the marker, and use a standard block plane to shave a bevel down the face of each side so the outer edge is at the desired thickness. This is a guide, don’t go much past that. That’s the thickness you are after. Next is to taper the shaft from leather to neck. That’s a straight flat, starting very narrow at the leather and gettting wider and wider as it gets down to the neck. You may need to remove some material at the neck to get this taper right, use a standard spokeshave here to make the hollow from the taper you are planing to the curve where the blade starts to swell out to its full width. Don’t round this area off yet, that comes when the blades are done. Out comes the tool you have chosen to remove the material from the blade to make it “hollow” from the center ridge to the edge. Work out from the marked centerline down the ridge out to the edge, I work from the tip in toward the neck as with the taper on the edge the grain is better to shave this way. 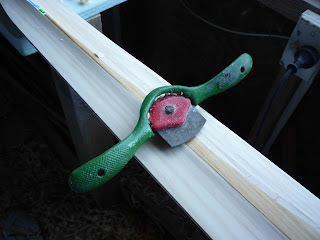 The random orbit sander can remove all the little ridges that the spokeshave or plane makes, so don’t fuss too much, just try for no lengthwise humps or hollows. When the blade is hollowed and thinned both sides, then fair it into the neck, remember that this is the high stress area of the oar, don’t remove too much material here, where that central spine merges into the wide part of the neck is the critical part. Don’t thin that down. Round the flat that you’ve planed onto the shaft into the body of the shaft aiming for a shape at the neck which is more like an oblong with the corners well rounded than a true oval or ellipse, sand off smooth and coat with varnish or paint. I’ll be painting the outboard end of the blades with white paint, the regular flashing of the white is visible from surprising distance. I’ll be fiberglassing the tips by the way, it reduces the chances of splitting the oar when pushing the boat off rocks or such. Just a little strip of 50mm tape folded over the tip and epoxied into place. I’ll go into the leathering and the shaping of the handle when I get around to that stage. 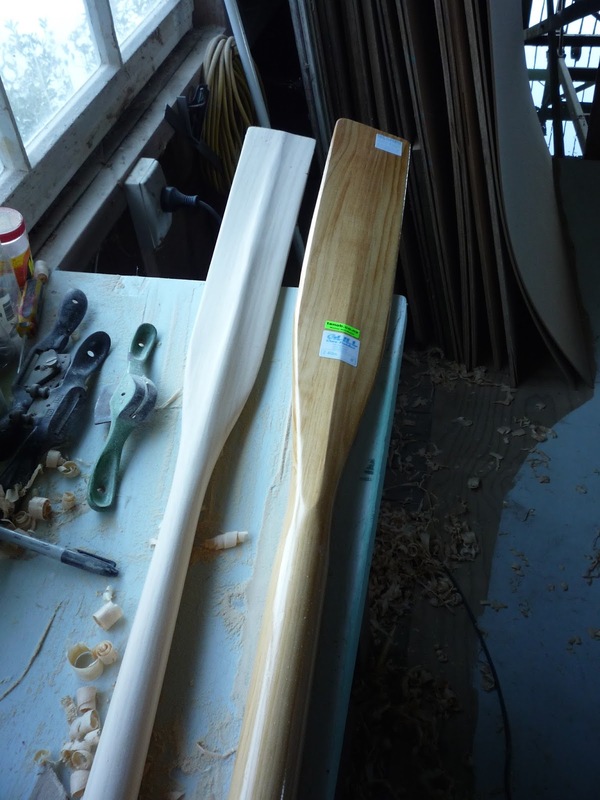 In the meantime, these oars have lost about 15% of their weight, and that almost all of it from out on the blade end which makes them much easier to use. It’s a beautiful day here, I’ve just had lunch, am sitting in the main cabin looking out over the river at the water sliding past. Its heading for the open sea, a space full of wide horizons, islands and adventures waiting to be had. Being as summertime is so close, I thought I’d post these pics that I came across while doing some digital filing. They’re inspiring. Roll on summertime. David Perillo in Navigator “Jaunty” and Paul Groom in Pathfinder “Varuna”. Thanks David for the pics, I bet they bring back memories. Buying the rope for the new boat. Well, we’re past the spring equinox, so its autumn for a lot of my friends in the northern hemisphere, the best time of year many tell me. We’re into spring here, warmer, more sun, and the orchards and fields are covered in flowers. 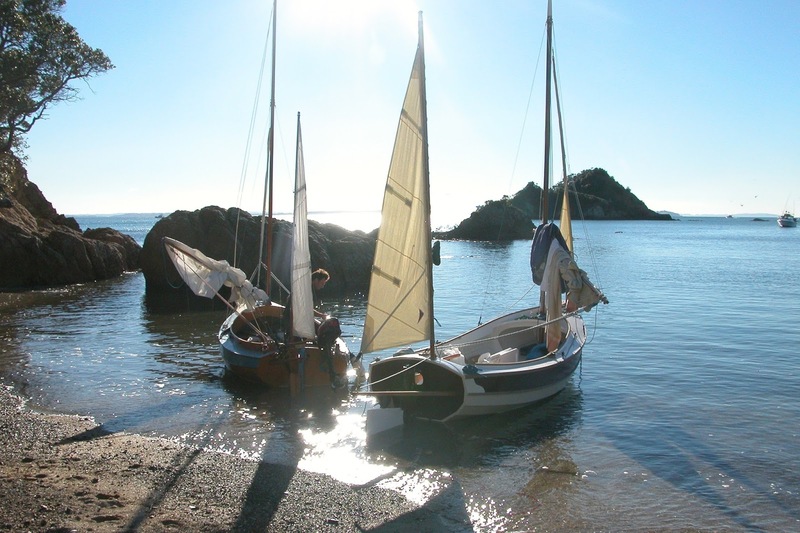 It’s a lovely time of year, while there are still stormy days to come the promise of summer is very evident and it’s a real incentive to get on with getting boats ready for the season. I’ll have to haul the ship out this summer, its three years since she was antifouled and the topsides need painting, so I’m buying sandpaper, getting all the gear ready and will be all ready and prepared when the time comes. George and Pam are getting some new steelwork done on the old slipway cradle at the Whangateau Traditional Boatyard and if that’s all done, that’s where I’m going. I’d rather that they had the bucks than the corporate that runs the local marina. I went out to day and happened past “Quality Equipment” in Glenfield on Aucklands North Shore. They’re rope manufacturers, and have a “rope shop” which is open to the public. The prices are very very good. Leon is the man there, good guy. 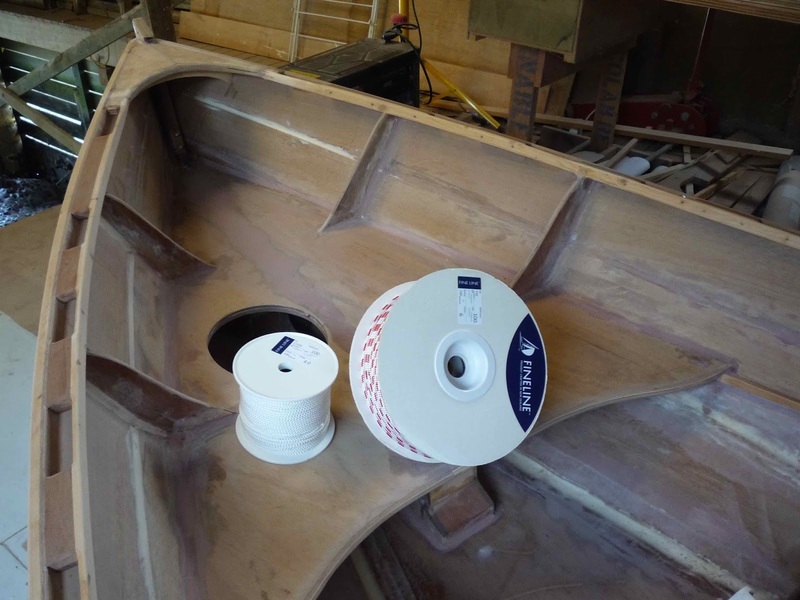 So, with rigging SEI in mind, plus some replacement ropework needed on the good ship May, I stopped in and came out with a 100m roll of 6mm yachtbraid for halyards and controls, and a 100m roll of 4mm polyester solbraid for reefing lines on the smaller boat. Yes I’ll have lots left over, but there will be other boats, and buying this way cost about $180. (US$113), That’s a lot of rope for the money, way less than the price the “yotshops” sell at. Email Leon at leon@qe.co.nz Tell him I sent you, it might help my discount next time I’m in there. Lots of "string", in imperial measure about 325 ft on each. I've already got the mainsheet on another roll bought for a boat a while back. I keep a fair inventory, some people see my shop as being a ships chandlery in itself, I suppose that they're right, except its one with only one customer. My next stop was not such a happy one. I’ve a Bosch GEX 125 random orbital sander, its probably 15 years old now, done lots of work, had a couple of bearings and a new set of brushes, and while effective enough is not my favourite tool. But I because I have it, I use it. I generally have fine paper on that and coarser paper on the Festool Rotex which IS my favourite tool of that type. But its worn out the velcro on the pad, so I went to the Power Tool Shop in Wairau road, yes they had one in stock, yes sir here it is. That will be $89 thank you. It should have been wrapped in gold leaf! The tool is not worth that, so the Power Tool Shop still own that part, and unless something changes that’s the last Bosch tool I’ll own. I did though manage to find a pair of oars at a deal that was not a lot more than the cost of enough high grade lumber to make a pair. they're heavy and a bit clumsy, the usual off the shelf ones, but with some effort with a sharp plane and spokeshave they'll be good. 2.4 m oars. When buying like this I regard them as partly shaped blanks. 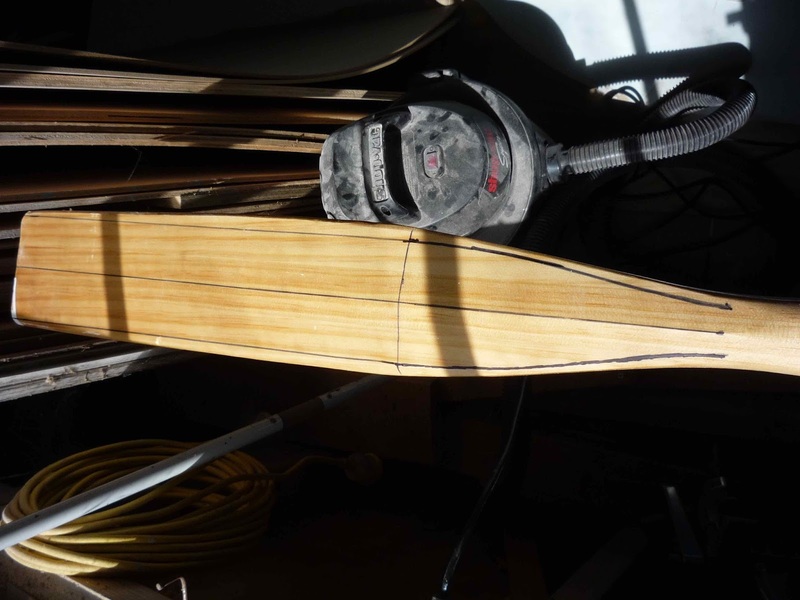 I take care with the grain orientation of the shafts, and try to ensure that the pair are as evenly matched as possible although 8 footers are not commonly stocked now, most being bought for yacht tenders so are little 6 ft 6in ones, thats way too short for SEI. I'll be running a "wot I did to these oar blanks" in a future blog, you'll hardly recognise them when I finish with making shavings. Time to go and paint the mast for SEI, she’s looking good. There are days when being an “armchair admiral” is not such a bad thing. To sit warm and comfortable, listening to the wind shrieking and laughing at you as it tears through the trees with the driving rain rattling on the windows and shaking the doors is a very pleasant thing. It’s a time to dream of warm days, sparkling water, golden beaches and gentle breezes. Of meeting people who enjoy the company of small boat sailors, exploring places where one can pretend that no human has ever been before, seeing new vistas every hour of every day and watching spectacular sunsets before retiring to a comfortable bunk and listening to the water lapping at the side of the boat. Its such a day here, springtime, and I wont go on about it because I’ve said it all before, springtime can bring tough weather here. But I’ve been sitting in my bunk, the boat surging at its dock lines, the wind doing all that stuff while I read this wonderful account of a cruise in a pair of “my” boats in Shark Bay, waaay north of Perth in Western Australia. It’s a great story, well written, well illustrated with both pics and video, so get your coffee made, sit down in a comfortable place, and read on. Many thanks to Author Paul Ricketts and cruising companion Peter Kovesi for sharing this, and to the “open boat” Yahoo group from which I got the above link. Great stuff guys, keep up the good work. I usually try for Thursday or Friday for each weeks post, but I’m a day or two early this week. Painting is happening. Yeehah! Not far to go now. When painting, the undercoat tends to show up all the nasties, the blips and bumps that should have been sanded out the holes that were not filled, the high spots that should have been taken down, nail heads that still show and the glossy bits on the epoxy that should have been flatted off. All the bits you don’t want people to see. So I paint early, just one coat of primer undercoat, then go over it with the sander and filler, that’s where I’m at now with SEI. I’ve got one end primer painted, I’m sanding at the other end, mainly with the magic FEIN multitool in triangle sander mode, the point of the triangle amazingly effective at sanding the radius in the corner fillets, and I’m finish sanding and am hiding the worst of the blemishes with filler back in the stern. I figured I’d try a little of the colours, I’ve gone lighter and brighter than usual as the paint, apart from the gunwale, is satin finish so wont reflect as much light. That plus selecting from a tiny square of colour on a piece of card with two dozen others is a bit of a raffle. I have mixed feelings on the result, it’s a bit “toy soldier”, maybe duller colours next time. But the paint has been bought, has been mixed and is there, so that’s whats going to be used. I’m sure I’ll get to like it in a while. Bright colours, they look better when the paints dried to its satin finish, and I think I'll put a little more green in the mix to make it slightly darker. Might even do something to dull the red a bit. Still, whats life without some experimentation. 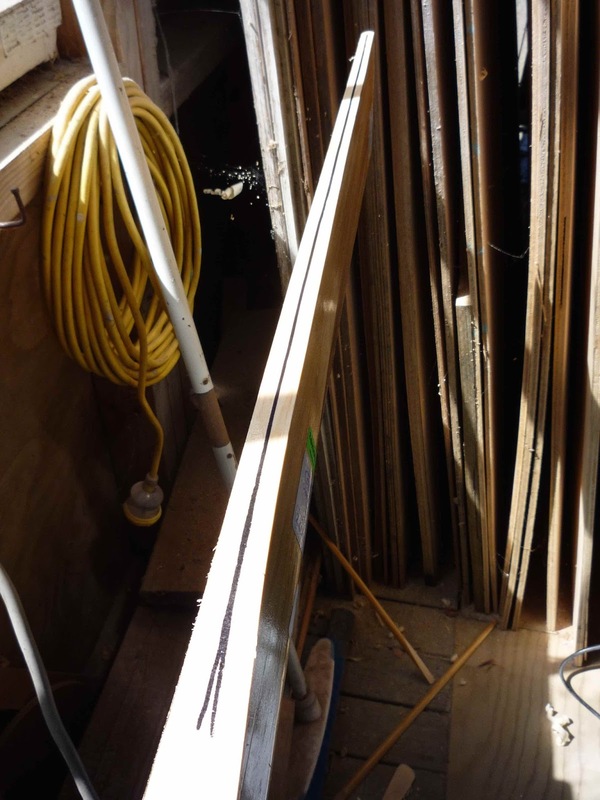 The shops in a mess I've some extra gear and nowhere much to put it so the next job after the boats done is to build more shelving up high. Need that storage. But the boats looking ok, I've not made an exceptionally nice job of her, she's a hurried build but structurally ok. Really she's a testbed and proof of concept build, and I've had rather a lot of other things that needed attention so its a bit of "do as I say not as I do" in this case. In places the paint looks good, hides lots of sins, the next coat will hide all that. I’m working my way forwards with sander, filler and brush as the wind howls in the trees around the shed. Its rough water out there on the estuary, with the wind against the tide its definitely not kayak weather. 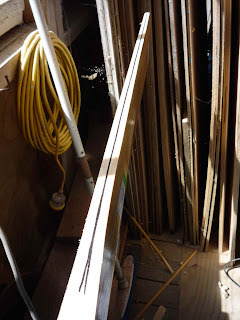 Inside the shed, working away dreaming of days out on sparkling water with gentle breezes is just fine, so being in here with the paintbrush and sander is no hardship.